Like Anzac, the term Digger is well known in Australia and overseas. Even for Australians who have no military connection, the word is still familiar and widely employed by the media to report news of Australian soldiers, especially in places of conflict, although the term can embrace all soldiers and others in the Australian Defence Force. The genesis of the word has been the subject of often intense debate for over eight decades. Let’s see if the origin of the term can be narrowed down and even identified. The word Digger has been around since the early days of the gold rush in Australia and anecdotally there is evidence that some Colonial Australians were given the nickname Digger because of their mining endeavours. Even earlier, in the 1600’s, Shakespeare referred to British Diggers and others in a military scenario. There is evidence that the term was also used in the Boer War but probably in relation to the mining industry in South Africa where many Australians were employed before they joined up to fight the Boers. Then there is the popular Digger brand of Bendigo made tinned goods like jam, which was supplied in quantity to the Australian Imperial Force troops at camps such as Seymour at the beginning of World War One. But none of this really gels in the Aussie military usage sense. Photo at right of Gunner, Arthur Millar, an early digger on Gallipoli. It is soon apparent from a study of personal and even official correspondence from World War One that Australian and New Zealand soldiers were being referred to collectively, and addressed individually, as Diggers by mid 1917. 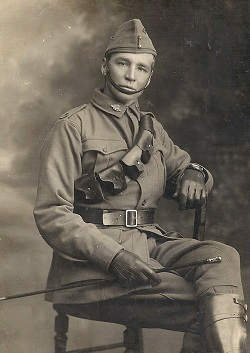 Private Tudor Roberts wrote in September 1917 from France that: "the name Digger came from the (British) Tommies who think we Australians are all miners or cowboys." Charles Bean the Australian Official War Historian writing of the mid 1917 period said: "It was at this stage that Australian soldiers came to be known, together with the New Zealanders, as the Diggers…the term had been occasionally heard before." Bean was right. It had been heard before. The late Australian historian John Laffin recorded that his mother, a World War One nurse heard the appellation Digger being used in 1916. Returning to the Official History and its commentary on the immediate assessment of the April 25th ANZAC landings on Gallipoli, which some local commanders deemed a debacle. The history documents British Commander General Hamilton urging the ANZAC leader William Birdwood, that, "having got through the difficult business (of landing), now you have only to dig, dig, dig." The message was passed down the ranks to those Anzac’s fighting cheek to jowl with the Turks protected by only a few shovels full of dirt. It is not surprising that, as Bean continues, "the dry humour of the soldiers picked up on the term." Journalists in the field were quick to grasp the significance of ‘Digging’ for the Anzac’s. One reporter refers to them on Gallipoli in October 1915 as, "The best trench diggers in the (British) Army. They work like bullocks, fight like tigers, yet are so cheerful." He added kindly. Their early indiscipline has quite disappeared. Photo above right of Private Bert Nunn, a proud World War Two digger. Earlier than all the others is a statement from a Western Australian soldier in 1932 who writes to correct other views on the origin of the term ‘Digger’ being debated in the RSL journal Reveille. This man, a veteran from Narrogin who used the sobriquet of Mahomet, recalled that General Birdwood addressed the men of the 11th Battalion at Mena camp near Cairo before the move to Lemnos Island on 1st March 1915, and preparatory to the landings on Gallipoli. At that time Birdwood warned the troops that they had to be good diggers and good soldiers. Mahomet insisted that the term caught on from that point. No doubt it gained impetus with the need on Gallipoli to dig and tunnel, a tactic which later became even more necessary in France and Flanders. As there was a much larger and more diverse number of troops engaged in Europe, each striving for national identity in the mud and carnage, it is likely the term became even more widespread. Caught on it did. 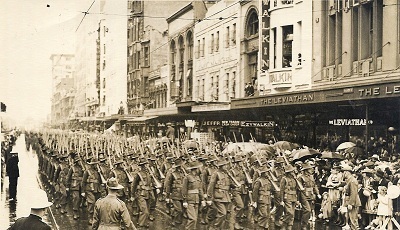 Digger became the general mode of address for Australian and New Zealand soldiers although its usage disappeared for the latter troops, who became known simply as Kiwi’s. Australian soldiers in World War One soon adopted the term with great pride and continue to do so. David Symers was an Albany grocer’s assistant but called himself Digger until he was killed in action in late 1917. A prominent Australian soldier boxer called himself Digger during the war and Prime Minister Billy Hughes carried the nickname of the Little Digger like a battle honour. A movie called ‘Digger’ was released in the 1930’s; off-spring of World War One veterans were Christened Digger; and there was a post War entertainment group consisting of several veterans who called themselves The Diggers. 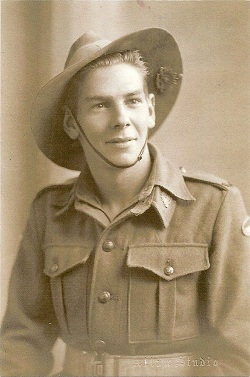 It was even suggested in Parliament that the rank of the Australian Private soldier should become Digger. Little wonder the successive waves of Australian soldiers in World War Two and beyond have eagerly continued using the name. 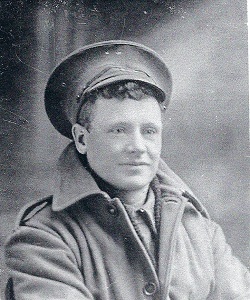 Photo above right of Private Tom Cross, a digger who fell on the Western Front. "What these men did nothing can alter now. The good and the bad, the greatness and smallness of their story will stand. It rises, as it will always rise, above the mists of ages, a monument to great hearted men; and for their nation, a possession for ever." Photo below, diggers of 1940 march off to war. Lieutenant Colonel Neil Smith spent 24 years in the Army throughout Australia and overseas including active service in Vietnam and Explosive Ordnance Disposal duties for which he was decorated with the Order of Australia. Since resigning 20 years ago Neil and his wife Sylvie have developed Mostly Unsung, a unique military history research business using resources in London and around Australia. Neil has researched and compiled scores of publications and articles on servicemen and women, various regiments and conflicts ranging from the British garrison in Australia through the Boer War, both World Wars and post 1945 conflicts such as the Malayan Emergency. He is well known for his media and documentary work and frequently provides presentations on military history, where the emphasis is always on those who served. For those who seek to trace the service of their military ancestors in Australia and Great Britain, Neil Smith and Mostly Unsung will have the solution.